278 Clarendon is located on SW corner of Beacon and Clarendon, with 182 Beacon to the north, across Beacon, 274 Clarendon to the south, across Alley 419, 285 Clarendon (201 Beacon) to the east, across Clarendon, and 205 Beacon to the west. 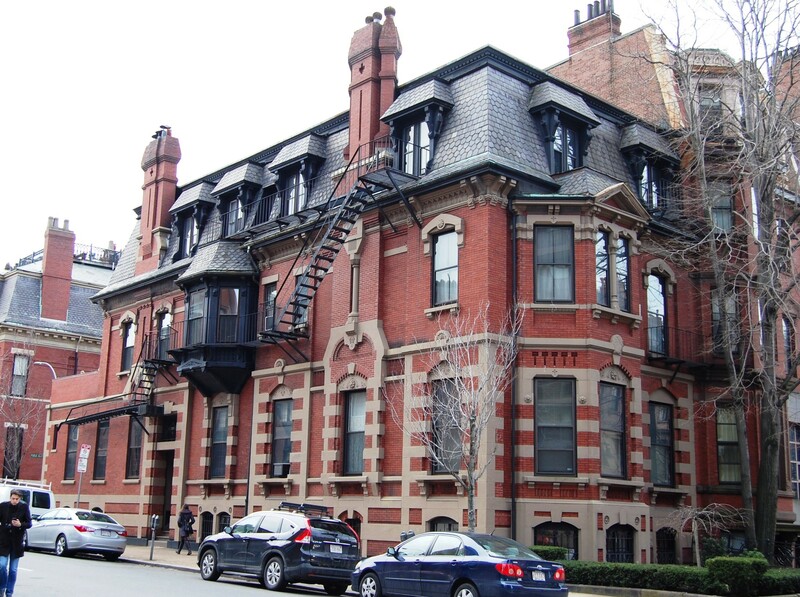 278 Clarendon (203 Beacon) was built in 1870, designed by architect Charles Brigham of the firm of Sturgis and Brigham. Correspondence from Charles Brigham to his partner, John Hubbard Sturgis, indicates that excavation of the site began in November of 1869. The structure was completed by late August of 1870, with much of the interior finishing still be to be done. As originally built, the entrance was on Beacon with the address of 203 Beacon. It was moved Clarendon ca. 1919 and the address became 278 Clarendon. 203 Beacon was built as the home of banker Francis Welles Hunnewell and his wife, Margaret (Fassitt) Hunnewell, on land he purchased from the Commonwealth of Massachusetts on November 6, 1869. They previously had lived at 129 Beacon. They also maintained a home in Wellesley. Click here for an index to the deeds for 278 Clarendon (203 Beacon). Margaret Hunnewell died in February of 1876 in Nice, France, and Francis Hunnewell married again in August of 1889 to Gertrude G. Sturgis, the daughter of architect John Hubbard Sturgis. She died in March of 1890. 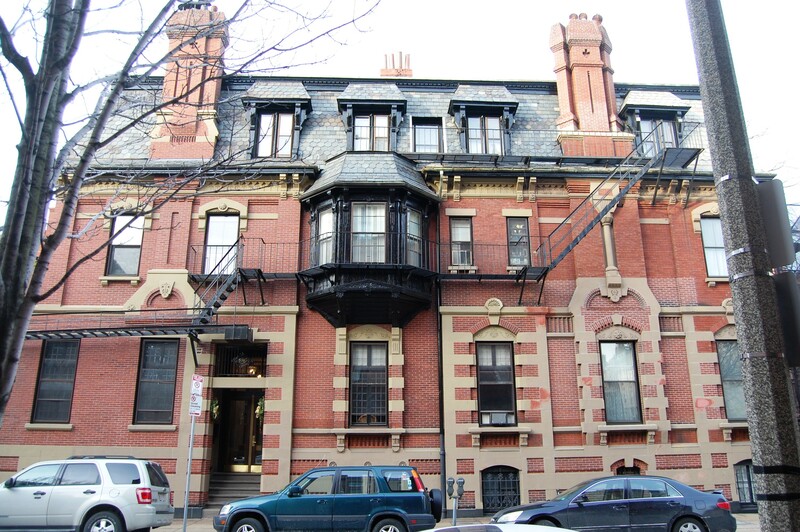 Francis Hunnewell continued to live at 203 Beacon until his death in September of 1917. On May 15, 1919, 203 Beacon was purchased from Francis Hunnewell’s estate by attorney Paul Barron Watson. During the 1918-1919 winter season, he and his wife, Katharine Hurlburt (Clarke) Watson, lived at the Hotel Somerset. They also maintained a home in Milton. The Watsons significantly remodeled 203 Beacon, including building an addition on Clarendon extending the house into the rear yard and moving the entrance from Beacon to Clarendon. Thereafter, the address was 278 Clarendon. 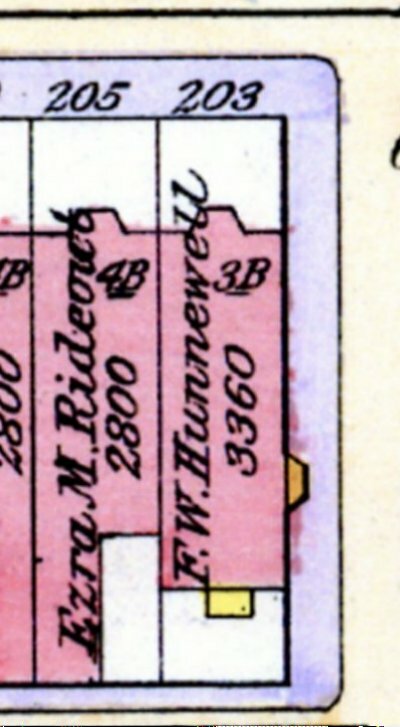 The Watsons lived at 278 Clarendon during at least part of the 1919-1920 winter season, listed in the 1920 Blue Book both at the Hotel Somerset and as Mr. and Mrs. Paul W. Watson at 284 Clarendon (a non-existent address). On July 13, 1920, Paul Watson sold 278 Clarendon to Thomas Barbour. The Watsons returned to the Hotel Somerset for the 1920-1921 winter season and then moved to 79 Marlborough by the subsequent season. 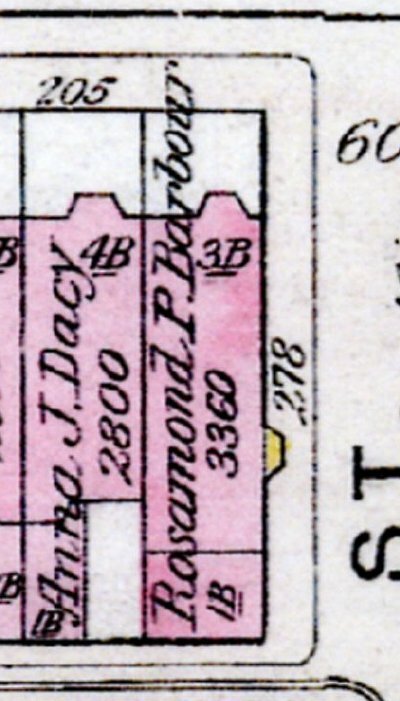 Thomas Barbour and his wife, Rosamond (Pierce) Barbour, made 278 Clarendon their home. They had lived at 12 Hereford until about 1918, after which they were in Cuba, where he was conducting zoological research. They had spent the 1919-1920 winter season in Palm Beach. They also maintained a home in Beverly Farms. Thomas Barbour was the Alexander Agassiz Professor of Zoology at Harvard. He had served a curator of the Harvard Museum of Comparative Zoology from 1911, and was named director of the museum in 1927. He undertook numerous zoological expeditions throughout the world on behalf of the museum. On October 21, 1920, Thomas Barbour transferred 278 Commonwealth into Rosamond Barbour’s name. Thomas Barbour died in January of 1946. 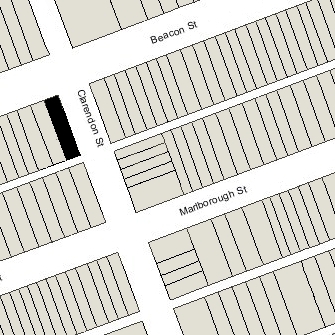 Rosamond Barbour continued to live at 278 Clarendon until her death in 1954. On March 8, 1955, 278 Clarendon was acquired from Rosamond Barbour’s estate by Mildred M. Baird, a lodging house operator and real estate dealer who lived in West Roxbury. On July 14, 1955, 278 Clarendon was acquired from Mildred Baird by real estate dealers Stuart H. Hastings and Joseph Gautreau. In July of 1955, Stuart Hastings applied for (and subsequently received) permission to convert the property from a single-family dwelling into eleven apartments. The property changed hands and on April 1, 1964, was acquired by Newbury Halls, Inc. In March of 1964, it applied for (and subsequently received) permission to convert the property into a dormitory. The permit was subsequently amended in May of 1965 to change the occupancy to three apartments and a dormitory (eight of the original 11 kitchens were removed and three were retained). The property changed hands and on June 1, 1965, was acquired by Chamberlayne School and Chamberlayne Junior College. In August of 1965, it acquired 274 Clarendon, which it also operated as a dormitory. Both buildings remained Chamberlayne dormitories in 1974. In the mid-1970s, Chamberlayne went bankrupt and on June 16, 1975, it transferred 274 Clarendon and 278 Clarendon to Bernard P. Rome, trustee in bankruptcy. On November 6, 1975, 274 Clarendon and 278 Clarendon were acquired from Bernard Rome by Rose Levin, Robert S. Levin, Howard N. Levin, Phoebe O. Feinstein, and Lawrence E. Levin, trustees under the will of Charles Levin. On the same day, they transferred both properties to Robert S. Levin and Howard N. Levin, trustees of the 274-278 Clarendon Trust. In January of 1976, the 274-278 Clarendon Trust filed for (and subsequently received) permission to change the legal occupancy of 278 Clarendon from a dormitory to ten apartments. On December 20, 1986, 274 Clarendon and 278 Clarendon were acquired from Robert Levin and Howard Levin by Gary M. Laskowski and Jonathan D. Betts, trustees of the Fairfield-274-278 Clarendon Trust. On December 23, 1986, they converted 278 Clarendon into ten condominium units, the 278 Clarendon Condominium.